The first step is to accept that there is a problem, then think of solutions, allow the process and see the result. I just want to post something just to say that I am happy for my loved ones because of the great things happening in their lives. Lots of breakthroughs. I am grateful for witnessing these things. God is good all the time. http://bible.com/111/isa.53.3.niv He was despised and rejected by mankind, a man of suffering, and familiar with pain. Like one from whom people hide their faces he was despised, and we held him in low esteem. How comforting it is that Jesus understands what we are going through. He’s been mistreated as well just like us. He is familiar with pain. He knows about pain. He’s been held in low esteem. Rejected and alone. Mistreated. In pain. God understands these, too. What’s great is that He is able to defeat all of these trials. He’s victorious. And we can share in this victory only if we accept Him as our Lord and Savior. We are constantly invited to be in His loving presence. How comforting it is to know I am not alone–to know that I am loved. Before coming back here, I was reminded to keep my eye on the goal. From experience I have been like a sheep–easily distracted from what is in front of me. A few weeks ago, several days after I have come back, a distraction came. But as I was reminded, I have to keep my eye on my goal. Opportunities will come but I have to seek wisdom. This is also the message I have gathered from the easter service I attended. Waves will come in, but we should anchor with the right foundation so we won’t drift away. That is what faith is. I have been a drifter. I have backslided. But God is kind. He is still holding me–not letting me go. I thank Him for His grace. Whatever happens with my recent decision, I know that I’ve got to have faith. God is in control. He let things happen for a very good reason. And for now, I am just relieved that I’m back into God’s loving arms again. There are so many things I want to do. So many ideas, so little time. Oh I am interested in a lot of things and I want to immerse in them right away. It’s the pain at the lower right quadrant, the work pants that I could not close, and the difficulty in breathing. I am at my heaviest. 142lbs. It’s going to be long and tedious. But I’ve done it before. I just hope I’ll find my motivation soon. In my search upon the “perfect” perfume, I came upon an online shop that sells other scents made from the same company. in this online shop, I can have free shipping if I would purchase one body care products. 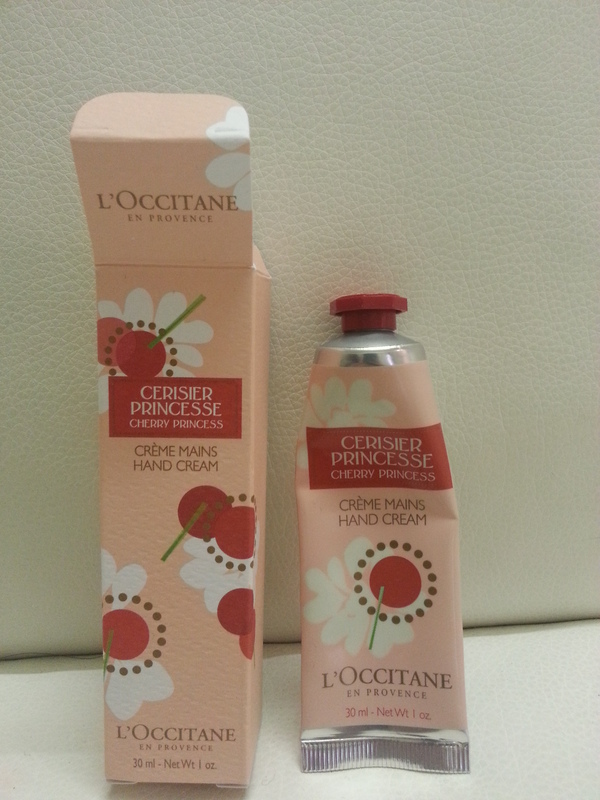 This is why I have L’Occitane’s Cerisier Princesse (Cherry Princess) Hand Cream. I am almost out of this so before I consume all of it, I might as well take a picture of this and write something about this product just so I would remember someday that once I have used a product as nice as this. It is enriched with shea butter which makes my hand soft and supple, perfect for winter or cold weather and also after washing my hands which I often do because of my work. But what I love most about this is the scent. it smells so nice. The price is a bit dear at $15, 30 ml but the quality is good so I would say that buying this cream has been worth it.